I made this tray about 10 years ago and I thought today it needed some updating. 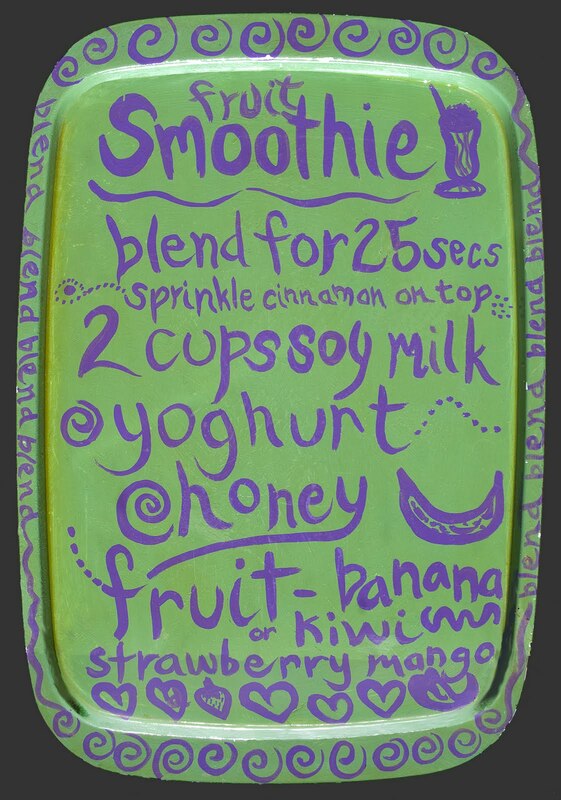 The smoothie has come a LONG way… Twenty plus years ago I was making what we all know as the classic smoothie- milk, yoghurt, fruit- usually banana and honey. 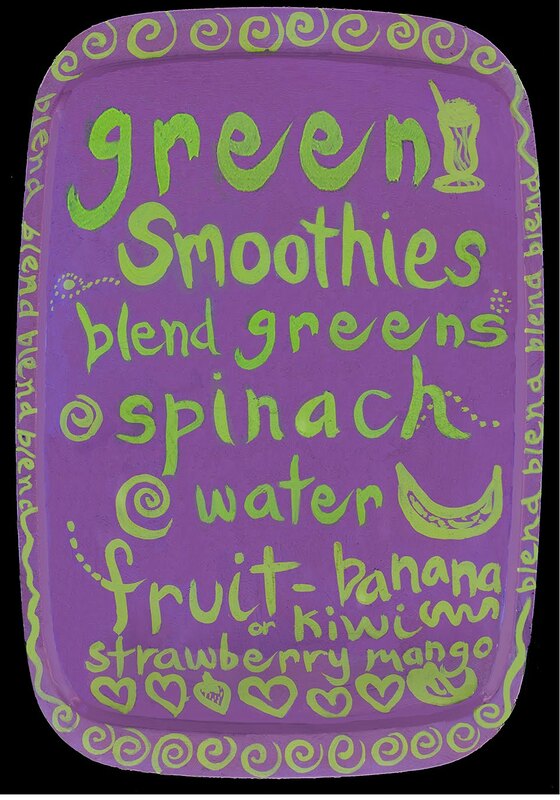 This was before Boost and smoothies going commercial of course and then in 2004 Victoria Boutenko invented the green smoothie- you can read how she did this and why in her book Green For Life. 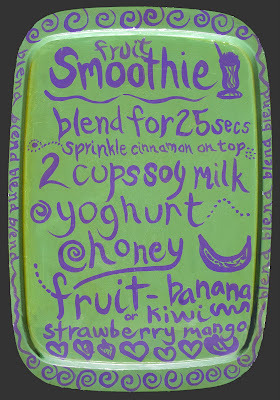 One of the best things about green smoothies is that you don’t need to use milk or any dairy substitute. 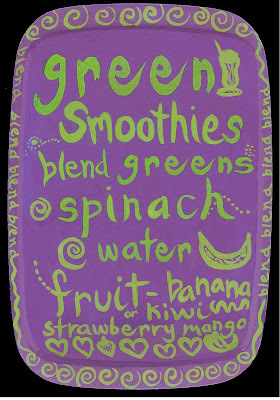 This means you can add more calcium rich greens and other less acidic healthier ingredients. I had my tonsils removed when I was 5 and had continual allergy symptoms, sinus problems and eczma and spent years taking sleep inducing anti-histamines. Drinking or even smelling milk made me feel nauseous but since going dairy free I haven’t had a single sinus, chest infection, cold or flu for years. I used to drink soy then rice milk but since giving up cooked cereal breakfasts and milky drinks and drinking gsmoothies I don’t need to buy it anymore- means more money for other more nutritionally better food. We’ve all grown up with the calcium myth and why we think we should eat/drink dairy. We are the only species who drink the milk designed for a completely different species. I have always wondered why non-dairy eating cultures don’t have the levels of osteoporosis that Western cultures do but highly processed acidic diets can leach calcium from bones eg all the white stuff white flour, white rice, white bread, dairy and sugar- combined with a low consumption of fresh vegetables especially leafy raw greens. Western medicine’s only solution is to eat more dairy and take another tablet and supplements.